A new unfortunate record has been set in container shipping with news that the seven-year-old panamax Hammonia Grenada has been sent for scrap. The German controlled ship was delivered in January 2010 from a yard in China. Hammonia Reederei has bagged $5.5m from the sale of the 4,249 teu ship. The ship came off hire from Maersk Line at the end of November and with panamax boxships now the most unpopular sector in shipping it has since failed to find work and has been moored off Singapore. 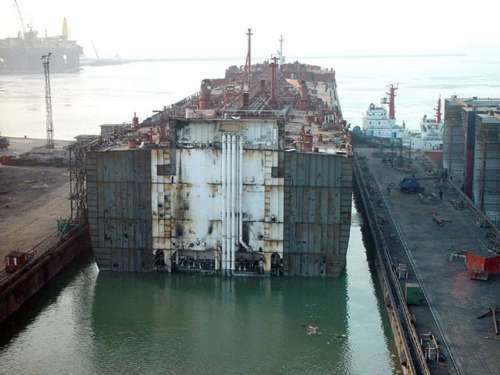 By a few of months it beats the India Rickmers, which was scrapped late last year, to the unenviable title of youngest boxship ever sent for demolition. Some 700,000 teu of containerships were scrapped last year with panamaxes the most favoured for the scrapheap in the wake of the opening of the expanded Panama Canal. Panamax boxships have witnessed the fastest, most significant value destruction of any ship type in more than a generation and plenty more sub-10-year-old vessels will likely end up in recycling yards this year. I d like to see them banks evaluating collateral on cash flow projections from now on!